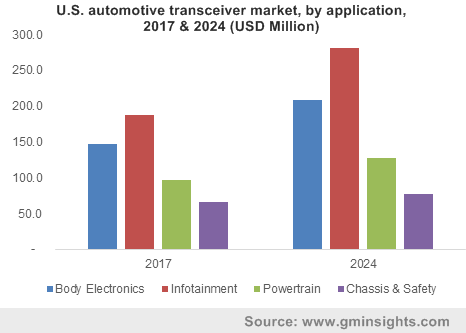 Automotive & Transportation « Global Market Insights, Inc.
Owing to an unprecedented rate of technological development in the automobile sector, the global automotive transceivers market has expanded at a remarkable pace. The influx of numerous in-built features in a vehicle, such as safety and infotainment systems, based on advanced connectivity protocols have create a need for high quality electronic components. The automotive transceivers market has experienced tremendous impulsion to meet this demand of improved communication capabilities for supporting multiple protocols. The chassis and safety segment, in particular, has become a critical application area for the automotive transceivers industry with the advent of technologies like electric power steering (EPS) as well as autonomous features. Traditionally, most of the power steering systems in vehicles are hydraulic systems, but the electric power steering systems are gaining enormous momentum due to the increased efficiency and performance they offer. Elimination of the different physical components of a hydraulic system makes EPS a smaller and lighter alternative, depending mostly on communication between electronic control units and sensors. The growing adoption of EPS in cars and commercial vehicles will propel the automotive transceivers market revenue. A key benefit of the EPS system is that it powers the EPS motor only when it is required, making it notably more efficient. Being a low cost way to provide a more comfortable driving experience, continuous advancements in EPS technology will further push the automotive transceivers industry evolution for delivering more enhanced products. Today, EPS allows for the integration of automated driving in combination with increased safety for the driver. It has been reported that 90% of all traffic accidents are caused by human errors, which can be reduced by automated driving features. Also, EPS has lesser weight as compared to conventional steering systems and some EPS offerings, like Bosch’s Servolectric, being up to 20% lighter. Global automobile manufacturers are installing EPS in their current and upcoming models to improve driver safety and include added features. Recently, Honda unveiled a new Sport model of its HR-V lineup for Europe which has Honda’s Agile Handling Assist system, a specific steering feature. It utilizes a variable EPS for adjusting the amount of feel through the wheel based on steering angle and speed. Honda claims the system delivers a steady and smoother response for different steering angles, making it safer to drive. As increasing number of vehicles are produced with similar systems incorporated within them, the automotive transceivers market can be expected to register a higher growth rate from the chassis and safety segment. A significant development in vehicle technology that has strengthened the automotive transceivers industry is the advent of advanced driver-assistance systems (ADAS), which can also be combined with EPS. Several features like blind spot detection, lane assist, forward collision warning are being added into cars to improve the overall safety of drivers and passengers. With the help of innumerable connectivity solutions fused into a vehicle, these ADAS capabilities can be merged with EPS to provide an easier and more reliable safety system. Automaker Jaguar has demonstrated the same in its E-Pace model, in which the company has added considerable ADAS technologies. Speaking further, the car has rear parking sensors and camera for assisting the driver, and this camera is also connected to the EPS for enabling blind spot detect function to reduce the possibilities of sideswipe collisions on roads having multiple lanes. Such a combination of different safety technologies in a vehicle signifies the potential of the automotive transceivers industry for boosting the advancement of these functions. Experts have predicted that efficient and proper use of ADAS functions can reduce all vehicle crasher by nearly 40% and all traffic deaths by almost 30%, displaying the necessity of ADAS in all future vehicles. Worldwide, the mounting concerns regarding environmental pollution has put the focus on electric vehicles, which are the prime target market for the latest ADAS and EPS products. The International Energy Agency has projected that by 2030, almost 125 million electric vehicles would have hit the roads globally, indicating lucrative prospects for the automotive transceivers market over the next few years. Anticipated to reach a global valuation of more than USD 7 billion by 2024, the automotive transceivers market is characterized by the presence of small and large players, including Infineon Technologies, NXP Semiconductors, Texas Instruments, Broadcom, Inc. and Cypress Semiconductor Corporation. This entry was posted in Automotive & Transportation and tagged ADAS, Auto Transmission, Automotive Transceivers Market, Automotive Transceivers Market Forecast, Automotive Transceivers Market Growth, Automotive Transceivers Market Share, Automotive Transceivers Market Size, Autonomous Driving, Body Control Module, Body Electronics, CAN, Chassis & Safety, Dashboard, Electric Power Steering, Engine Management System, Ethernet, FlexRay, HVAC, Infotainment, LIN, Multimedia, Navigation, Powertrain, Telematics. 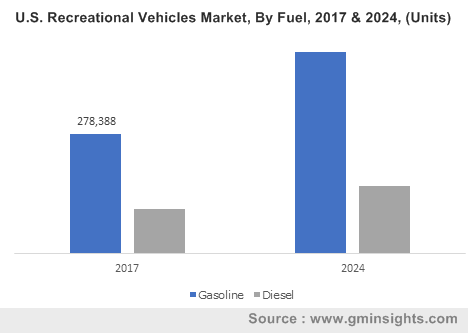 Recreational vehicles, owing to their comfort & connectivity, are massively adopted by tourists of late, stimulating recreational vehicles market. That said, in order to promote the regional tourism industry, several countries have been investing in the deployment of recreational vehicles. These vehicles are priced higher when compared to the conventional vehicles owing to which, numerous travelers have been giving preference to rental services. In this regard, rental service industries have also been looking forward to attracting more consumers by providing high-quality product ranges with sufficient insurance and low-cost maintenance facilities. The increasing popularity of high-end luxury and fuel-efficient recreational vehicles is thus slated to boost recreational vehicles market over the years ahead. In the last few years, the demand for motorhomes has increased tremendously, encouraging vehicle manufacturers to design newer models of the same. As of now, most of the automakers have increased their production capabilities to fulfil the rising vehicle demand. Recently, the German motorhome and campervan manufacturer, Hymer has officially declared the launch of new variants of its motorhome product that is expected to be mainstream by 2019. In its newly designed vehicles, it has integrated the Mercedes-Benz Sprinter to enhance the vehicle profile. It has also improvised the interior of the vehicle and reduced its overall weight by using glass reinforced plastics for manufacturing various vehicle components such as water tanks, double floor, plumbing, and heating systems. In addition, this motorhome manufacturer has also entered the UK recreational vehicles market with the launch of three new A-class models. The increasing popularity of moving restaurants has also had a considerable impact on the recreational vehicles industry size. Rather than constructing a new building for hotels, there has been a surging preference of late, for on-vehicle hotels that resolves the issues of food, shelter, and income on a single platform. In fact, space utilization for hospitality and residential purposes was a major concern that prompted Protec to launch a new Q18 motorhome. With extensive research and development, Protec has configured new motorhome that is equipped with a dry bathroom, dining room, full kitchen, sink, fridge with freezer, and an additional pull-out worktop. The deployment of luxurious amenities in the vehicle will further fuel the product demand that will ultimately boost the recreational vehicles market outlook. Though the luxury motorhome has become more popular, its higher cost has been restricting buyers to invest in its production. Taking into account the future business opportunities in class-A motorhomes, renowned recreational vehicle manufacturers have been working together to develop an affordable package of the recreational vehicle. For instance, in January 2018, the American recreational vehicle manufacturer, Jayco Inc., collaborated with the specialty chassis and vehicle design leader, Spartan Specialty Vehicles to introduce a luxury class A diesel motorhome. While designing this new vehicle, they have considered all the luxury aspects for making it accessible for the younger crowd of enthusiastic buyers. They also have taken into consideration the preferences of customers who are looking for smaller coach sizes for better serviceability. This customer-centric view of vehicle manufacturers will considerably stimulate the demand for motorhomes which procured 50% of recreational vehicles industry share in 2017. It is noteworthy to mention that the shifting trends toward the development of emission-free vehicles for controlling the pollution level in the environment have generated a new business avenue for vehicle manufacturers. 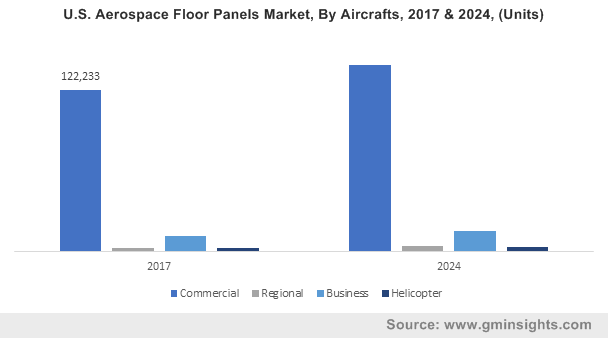 In fact, some companies have been establishing electric vehicle platforms as well, in order to stay ahead of competition. The development of fuel-efficient and luxurious vehicles is poised to have a positive impact on the recreational vehicles industry size, which reportedly, over 2018-2024, will register a CAGR of 6%. This entry was posted in Automotive & Transportation and tagged Diesel, Fifth Wheel, Gasoline, Motorhomes, Recreational Vehicles Industry, Recreational Vehicles Market, Recreational Vehicles Market Size, RV Industry Outlook, RV Industry statistics, RV Industry Trends, RV Manufacturer Market Share, RV Market, Tent Trailer, Towable RVs, Travel Trailer. Automotive human-machine interface (HMI) market has lately emerged as one of the massive revenue generating spheres in the automotive sector with the shifting trends toward the adoption of smart vehicles. Traditionally, pertaining to the lack of advanced infotainment and digitalized internal car design, drivers had been unable to operate the vehicle efficiently. However, with the advent of new technology trends, the overall design structure of automobiles has changed considerably, paving the way for integrated human-machine interface in vehicles. The development of connected cars for decreasing the chances of accidents and enhancing the operability of vehicles has also helped propel automotive human machine interface industry share. One of the most pivotal driving forces of automotive human-machine interface market is the emergence of smartphones, artificial intelligence, IoT (Internet of Things), and machine learning technologies that have substantially encouraged automakers to carry out product development activities for transforming the existing infotainment system of the vehicle. Validating the aforementioned fact, recently, the American automotive electronics supplier Visteon Corporation developed a next-generation cockpit controller, SmartCore that has been deployed in Daimler’s upcoming Mercedes-Benz A-Class vehicles. These will be the world’s first vehicles integrated with intelligent cockpit controllers with multiple central processing units. The deployment of such features in the interior design enhances a vehicle’s infotainment display and instrument cluster. Moreover, it also helps drivers personalize their experience by simply operating touchscreen and touchpad on the steering wheel. Increasing awareness among the regulators and regional governments about the surging need for vehicle security and safety has been driving the requirement of the instrument clusters and digital infotainment systems. The policymakers claim that the implementation of a human-machine interface will help the driver collect accurate information about the surrounding environment. In order to comply with the stringent regulatory compliances, most of the automakers, technology companies, manufacturers, and designers have been striving to innovate advanced solutions for passenger vehicles and connected cars. Indeed, passenger vehicles are expected to account for nearly 80% share of automotive human machine interface market by the end of 2024. 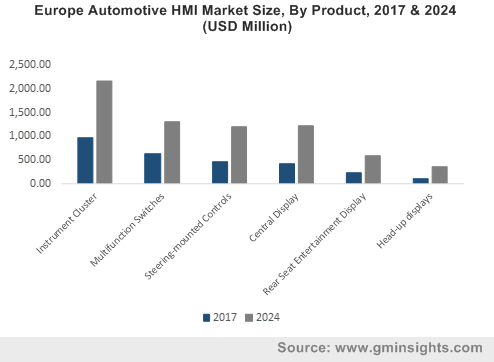 Speaking beyond the conventional vehicular systems, the increasing popularity of autonomous vehicles will have a notable influence on the automotive HMI market trends over the years ahead. Focusing on the shifting trends toward the growing adoption of autonomous vehicles across the globe, companies involved in the development of human-machine interfaces have been developing innovative software packages. For instance, a few days before, leading supplier of advanced semiconductor solutions, Renesas Electronics Corporation has introduced a new microprocessor unit to accelerate and simplify the development of modernized HMI and camera-based applications. The newly developed software interface can be used for operating video surveillance systems, fingerprint access control, information communication technology applications that have been deployed in automobiles. The growing popularity of HMI for managing vehicular systems in a highly sophisticated way is poised to stimulate the future product demand. As of now, motorcycle manufacturers have also been integrating HMI technology in the vehicle for improving performance, driving experience, and safety. Few weeks before, the British electric motorbike manufacturer had launched a fully electric motorcycle with human-machine interface. The evolution of e-bikes for promoting high performance and energy security is poised to have a considerable impact on the demand for HMI. In addition, considering the future energy benefits and depleting fossil fuel resources, most of the regional governments have been implementing a supportive regulatory framework to enhance the deployment of e-vehicles that also will fuel the product demand. The surging use of digital technology in vehicles for achieving better performance and sustainability will transform the future of the automotive industry. The extensive utilization of software for enabling numerous operational packages comprising functional safety, cybersecurity, and infotainment system will also stimulate industry trends. For the record, by the of 2024, automotive human machine interface (HMI) market will surpass a revenue collection of USD 27 billion. This entry was posted in Automotive & Transportation and tagged Acoustic, Automotive HMI Market, Automotive HMI Market Size, Automotive Human Machine Interface Market, Central Display, Commercial Vehicle, Global Automotive HMI Market, Head Up Display, Instrument Cluster, Mechanical, Multifunction Switches, Multimodal Interface, Passenger Vehicle, Rear Seat Entertainment Display, Standard Interface, Steering-mounted Controls, Visual. Owing to increasing preference toward off-roading events and the gradual uptick in recreational spending, the North America youth ATV & UTV market has garnered unprecedented traction in the past few years. Several private agencies, clubs, and organizations have been organizing recreation activities that consist of off-roading events across backcountry roads, trails and cross-country terrains. These events and competitions have led attracted youngsters toward adventure sports and motorsports which has, in turn, fueled the growth prospects of the North America youth ATV & UTV industry. Even though the need to utilize off-road vehicles arose out of the challenges to tackle difficult geographical terrain and climatic conditions across various nations, the popularity of ATVs and UTVs has been on the rise in the recent times. These off-road vehicles have emerged as the most preferred vehicles for touring through national parks, beaches, and for racing purposes. North American nations like the U.S. and Canada have humongous national reserves and state parks where off-beat routes and trails have been built by the government. Various state governments in the U.S. have been spending millions to construct and maintain off-road routes and trails in national parks – a factor that has invariably benefited the North America youth ATV & UTV industry. For instance, the policy board of the State Department of Natural Resources in Wisconsin approved a master plan in 2017 to add 200 miles of routes for ATVs in the Northern Highland-American Legion State Forest. Apart from commissioning new trails, the board has completed recreational opportunities analysis of a large parcel of natural area in northern Wisconsin and has further identified potential sites for ATV routes. Needless to mention, the initiatives being undertaken by government authorities along with increasing budgetary allocations to build new off-road trails would be helpful for recreational enthusiasts and boost adventure sports in the region. That being said, numerous national parks in the states such as Wisconsin in the U.S. have emerged as major geographical terrains that assist North America youth ATV & UTV market participants to expand their commercialization scale in the recent times. Subsequently, the companies operating in the North America youth ATV and UTV market have been proactive in incorporating advanced technologies in these vehicles, catering to the evolving requirements of enthusiasts participating in off-roading competitions. In this regard, it would be prudent to take note of the only single-seat youth off-road vehicle introduced last year by one of the chief industry magnates, Polaris. Reportedly, ACE 150 EFI of Polaris is the only 150cc youth model with a protective cab frame and other safety features such as parking brake, whip flag, side nets, and daytime LED running lights. Such highly advanced ATVs armed with technologically superior safety features are being increasingly introduced by numerous companies in the U.S. over the recent years. Apart from launching high-grade off-road vehicles, the prominent North America youth ATV and UTV industry players have focused on enhancing the ergonomic design of these vehicles that undoubtedly allow easier handling for youth riders and enables seamless maneuverability over obstacles. Although the profitability quotient of the North America youth ATV and UTV market appears highly promising, there are a few factors that might prove detrimental to the rapid product penetration in the years ahead. Rising number of accidents that are predominantly attributed to the ignorance of appropriate safety gear along with rash driving by youth could cast an adverse impact on the overall market share. According to an annual report published by the United States Consumer Product Safety Commission (CPSC), a total of 337 ATV-related fatalities were recorded across the nation in 2016. However, regulatory authorities including CPSC and other government bodies in various states of the U.S. and Canada are conducting various static and dynamic ATV-testing procedures to drastically improve the handling characteristics and identify methods to enhance the performance of these vehicles. 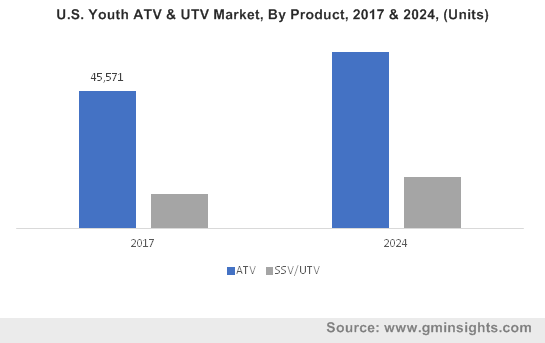 Owing to the launch of high-quality ATVs along with encouraging initiatives being rolled out by various governments across the continent, the North America youth ATV and UTV market is slated to register a commendable CAGR of more than 6.5 percent over the timespan of 2018 to 2024. In addition to this, the new testing guidelines and stringent regulatory overview would lead to the incorporation of more safety features in the forthcoming off-road vehicles, boosting the growth potential of the North America youth ATV and UTV industry. This entry was posted in Automotive & Transportation and tagged ATV, Electric, Gasoline, N.A. Youth ATV & UTV Market, North America Youth ATV & UTV Market, SSV, UTV, Youth ATV & UTV Market Size, Youth ATV Market. The global automotive LiDAR market – a rapidly growing vertical of the automotive sector, has been strongly consolidating its stance in its parent industry since the last half a decade or so. This business space, valued at over $150 million in 2017, has been depicting commendable growth particularly on account of the fact that sensor technology has become the primary methodology for many automatic and semi-automatic vehicles to sense their surroundings. Back in the day, LiDAR was majorly used in aerospace, military, meteorological and robotics sectors, however, with the advent of artificial intelligence which has made assisted driving a reality, the commercialization scope of automotive LiDAR market has been on an incline. 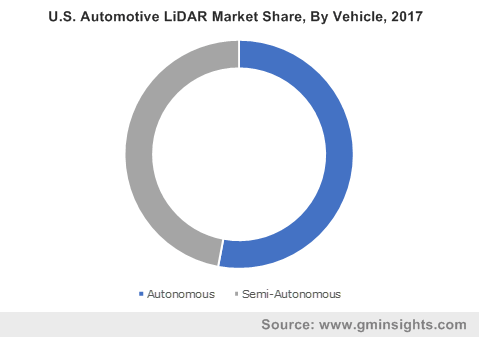 This entry was posted in Automotive & Transportation and tagged Automotive LiDAR Market, Automotive LiDAR Market Forecast, Automotive LiDAR Market Share, Automotive LiDAR Market Size, Autonomous, Global Automotive LiDAR Market, Mechanical, Semi-Autonomous, Solid State. Global automotive lighting market outlook has observed a plethora of changes in the last few years, driven by the shifting preference toward advanced efficient lighting as opposed to traditional lighting. Designed with highly innovative technologies, excellent aesthetics, and quality, automotive lighting systems, over the last few years, have undergone a sea of change pertaining to the advent of optics and laser technologies. In order to tap the popularity of advanced technologies, most of the automotive lighting market players are looking forward to focusing on product design alternations, acquisitions, and facility expansions. Driven by their efforts and the upcoming technology trends in electronic lighting, automotive lighting industry share is anticipated to observe commendable growth ahead. Digitalization of vehicle interiors and exteriors with LED lighting is one of the prominent technologies that has made its mark in modern vehicle lighting systems. The evaluation of highly functional, durable, and innovative products will have a significant impact on industry growth over the years ahead. For instance, recently, one of the world’s largest manufacturers of semiconductors, Osram Opto Semiconductors has partnered with ISELED Alliance for developing advanced solutions for automotive LED lighting. The German semiconductor manufacturer and ISELED alliance through this collaboration are looking forward to integrating effective hardware and software system to optimize LEDs. Over the last few years, with the increasing importance imparted to aesthetic and ergonomics of the vehicles’ interior as well as exterior, the design approach of contributors in the automotive lighting industry has indeed changed. They are now giving preference for the advancement of infotainment systems that will turn out to be rather beneficial for them in terms of revenue generation. As of now, the extensive use of LEDs for deploying lighting systems in vehicles will further stimulate the automotive lighting market size. As per estimates, automotive lighting market size from LED technology will register a CAGR of more than 7% over 2018-2024. The revolutionary development of high-performance light sources is also one of the approaches undertaken by companies to gain a competitive edge over their rivals in the automotive lighting market. 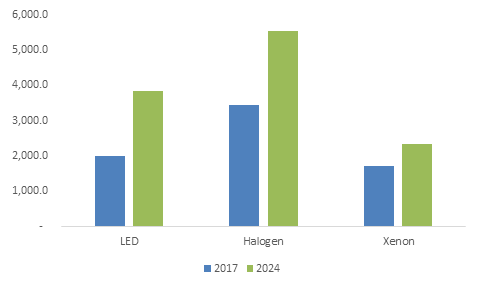 The growing awareness among the product developers about energy efficient lighting systems has been encouraging them to adopt new business tactics focused around this parameter. Merely a few months before, LG Electronics acquired the well-known automotive lighting and headlight systems provider, ZKW Group. This strategic merger has allowed LG to extend its regional reach across U.S., China, Mexico, and several countries in Europe continent. The ZKW Group incidentally, is one of the leading providers of lighting systems to European automotive giants comprising Daimler, Porsche, Audi, and BMW which have already ditched the use of traditional lighting technologies. The new consortium of LG and ZKW is planning to develop intelligent lighting solutions which will provide high-resolution information collected from the sensors and automotive communication systems. Considerable investments poured in by technology companies in new product development with the intention to expand the product range is slated to propel the automotive lighting industry share. In August 2018, the Canadian automotive product supplier, Magna acquired the headlight and lighting component provider, Olsa for expanding its automotive lighting business. With the acquisition of the Olsa, Magna has grown its lighting capabilities from designing and manufacturing of headlamps, tail lamps, and other lighting systems. Moreover, the acquisition of advanced technology will also help Magna better its portfolio in distinctive and featured lighting products. The rise in the integration of electronics in lighting systems and shifting focus of automakers toward styling will turn out to be rather fruitful for lighting product manufacturers. All in all, it would be accurate enough to quote that the transformation in conventional lighting systems has enhanced automotive lighting market trends over the last few years. Tech companies have also been conducting continuous research and development activities to introduce optimized and cost-effective lighting systems. Powered by the surging utilization of modern lighting systems in next generation vehicles, automotive lighting market size will register a CAGR of 5% over 2018-2024. This entry was posted in Automotive & Transportation and tagged Automotive Lighting Companies, Automotive Lighting Industry, Automotive Lighting Manufacturers, Automotive Lighting Market, Automotive Lighting Market Growth, Automotive Lighting Market Report, Automotive Lighting Market Share, Automotive Lighting Market Size, Automotive Lighting Market Trends, Commercial Vehicles, Front Lighting, Global Automotive Lighting Market, Halogen, Headlamps, Interior Lighting, LED, Passenger Cars, Rear Lighting, Side Lighting, Two-Wheelers, Xenon.